Week 14: Come On 2nd Trimester! This last week of the first trimester has been plagued by snow days. In the south, April is all about pretty flowers blooming, the sunshine warming up, and a breath of fresh air to clean out the winter dust that’s collected. Will has been in Montgomery, Alabama since Sunday morning for a TDY stint. I spent all day Sunday alone in the house with the dogs. Then Monday we had a “blizzard” that left us cooped up all day again. Then Tuesday morning it started snowing worse than it had Monday…and I nearly thought I was going to lose my mind. Thankfully that afternoon we caught a brief reprieve and I was able to escape the house to go to crossfit. Only to wake up Wednesday to more snow than the previous two days. Snow days are really not fun in SD. People are so used to (and over) the snow that they aren’t out having snow ball fights, sipping hot chocolate, and even if they wanted to, there aren’t hills to sled down. In other words, it’s boring. It’s beyond boring when your husband is out of town and you spend 3+ days staring your dogs in the face and watching a bazillion movies. But enough complaining. Supposedly warmer weather is coming. If you’ve been following along, it’s probably been pretty clear that the first trimester of pregnancy is full of uncertainties and lots of opportunities to worry yourself to death. It’s really easy to get caught up in thinking about every little thing that can go wrong, and worrying that you will become one of the millions of women who have lost their little peanuts. I feel like my mindset and emotional state are felt by our baby. So I decided early on to think positively. Sure it won’t change the outcome, but at the same time, neither will my worrying. While those things are there, what is more prevalent in the forums is an overwhelming amount of negativity. And I’m not referring to the women who have actually lost their babies and are saying goodbye. There are so many women, just absolutely freaking out on a daily basis. They buy home dopplers to hear their baby’s heartbeat every.single.day. (and they lose it if for some reason they can’t find it one day – babies really don’t like doptones and often try to move away from them which can make it hard to find a heartbeat even when things are perfectly fine). They post and stress about “what if’s” endlessly, and I’ve realized that even spending a couple of minutes on there (purposely avoiding as many of the obviously negative posts as I can), instead of feeling a sense of camaraderie with my fellow mothers-to-be, I feel down. Little uncertainties start sneaking in, and I too start worrying. What if my baby’s heartbeat stopped sometime since the last doctor’s appointment? What if my baby stopped growing? Am I feeling better because my baby didn’t make it and I should expect the worst? It’s so, so easy to get sucked in. Especially for a first time mother. I’ve started avoiding those forums. My baby and I deserve to be surrounded by positivity. I choose to believe God is in control. I can’t promise everything will go exactly as I want and hope, but I know he is watching over everything that is happening in my life…and he will make it ok. I don’t want to rob myself of the experience of the joy of being pregnant. Of enjoying all the parts, good and bad, that roll themselves into those 9 precious months. I’m not talking about Team Green, I’m talking about any green food that finds itself on my plate. I have completely lost my taste for my green friends. And it is very upsetting to me. I am normally a green fanatic. I seriously could down kale, mustard greens and collard greens by the garden full. Roasted broccoli or brussels sprouts were right up there with french fries to me. There was nothing more refreshing to me that a big green salad chocked full of fresh veggies. My dinner plate was usually half green vegetables, which I gobbled up first. This week I have absolutely had to force myself to eat my vegetables. Asparagus (my absolute fav) and I broke up weeks ago. Broccoli literally makes my mouth pucker. And sadly my beautifully prepped salad lettuce is now brown in the fridge because I just couldn’t bring myself to eat more than a few bowls of it. But because I know green foods are some of the best for my growing baby, I force myself to eat at least a solid serving at every meal. I’m hoping and praying my tastes come back. I even missed the idea of enjoying my favorite greens. Not to mention I’m heading to North Carolina in the not too distant future, to the land of garden fresh goodies, AND I WANT TO ENJOY THEM! The last week of the first trimester came to an end with a trip to Devils Tower. Will and I have been trying to get there since we moved here. It’s a little difficult to make time for because there is nothing else around the monument so it requires a special trip to see it. Sunday we took our chances with the threatening rain, and were pleasantly blessed with pretty weather just long enough to walk the trail and take some pictures. It was well worth the drive. We both admitted we would have been pretty sad if we had missed it while here. In looking back over the past few months, I’m thankful to say all-in-all it wasn’t too bad. I’m looking forward to more energy…and to a bump! Before we left to drive to Wyoming I was getting things together in the kitchen and Will rubbed my tummy which was slightly bulging over my jeans. Knowing that what he was feeling was pretty much just bloat and maybe the results of the Reese’s eggs I just had to have last week, I told him that didn’t make me feel too good with him rubbing my belly and acknowledging it’s not entirely flat anymore. He told me he was excited to see my belly grow. It melted my heart a little so I got over it. The fluffy stage of baby bumps is really just not fun haha! 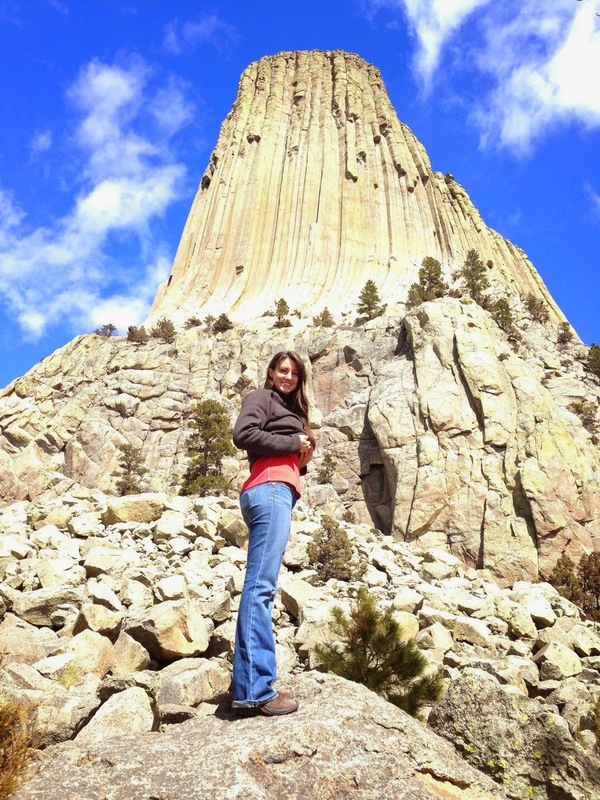 Here I am with my non-existent baby bump at Devil’s Tower. 13 weeks and 6 days. ← Week 13: Start Spreading the News! wow, it sounds so great! wonderful! I have never seen Devil's Tower. It's magnificent! I love all the places you show us on your posts. Hang in there. 1/3 down, 2/3 to go. And it does go fast!